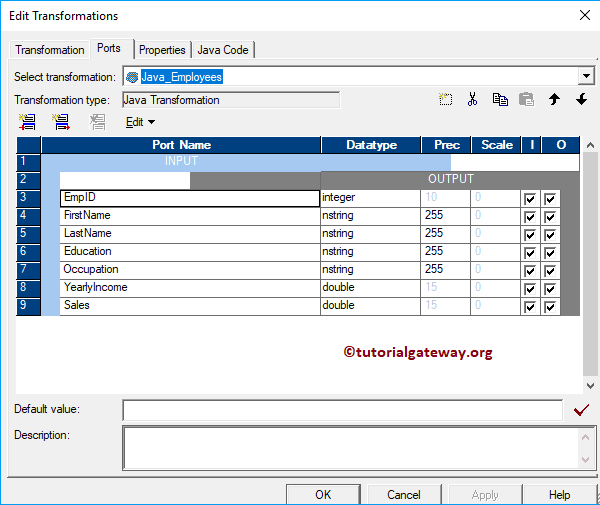 The Java Transformation in Informatica provides an opportunity to write a custom Java code within the transformation. If you are familiar with Java programming then you can write complex code inside this transformation. 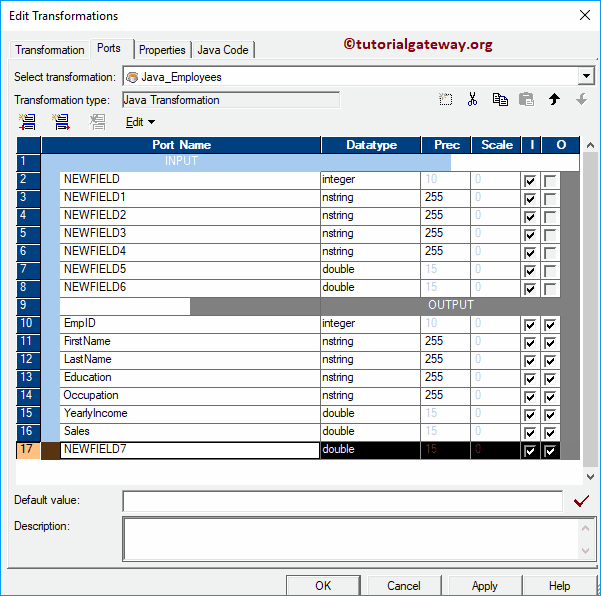 In this article, we will show you, How to use Informatica Java Transformation to alter the transformation data with an example. 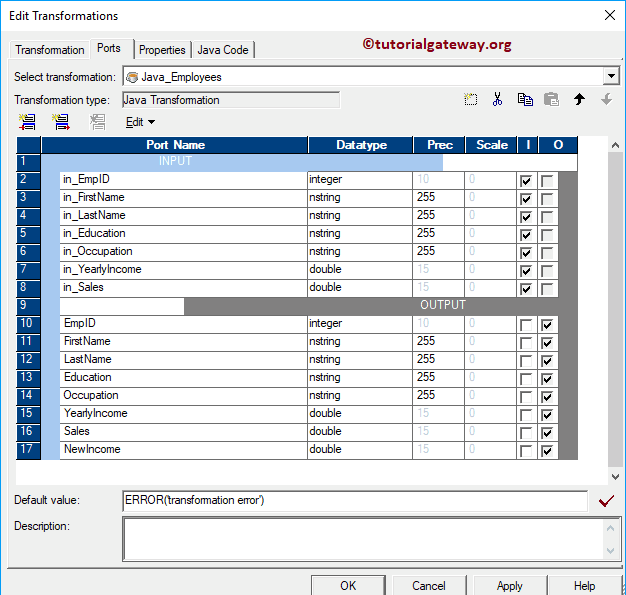 For this Informatica Java Transformation example, we are going to use SP Source and Destination tables. 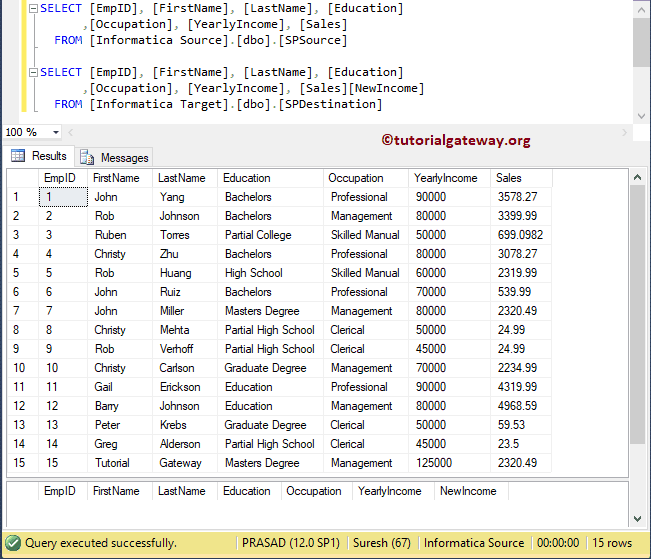 From the below screenshot you can see that the Source table has 15 records and Destination table is Empty. 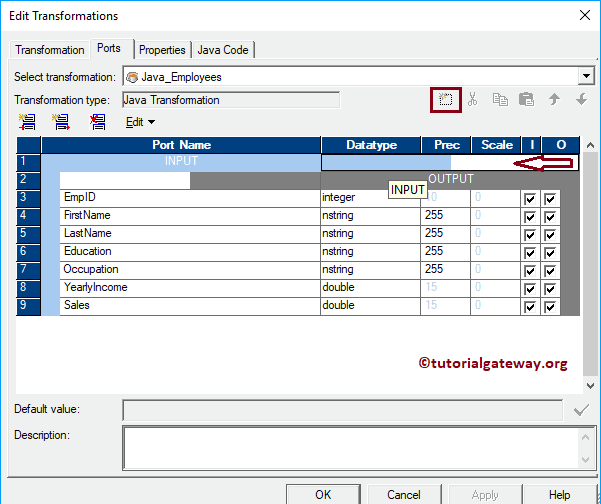 In this example, we will show you, How to create and configure Java Transformation in Informatica. 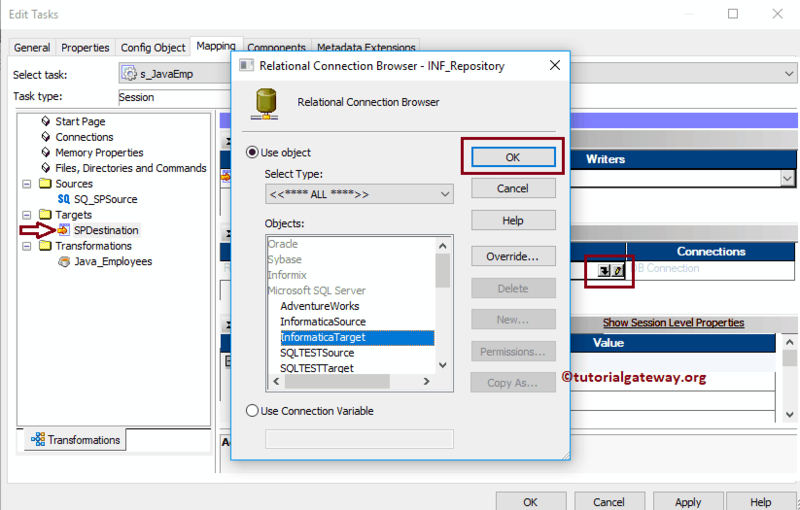 Before we start configuring, First let me connect with the Informatica repository service. 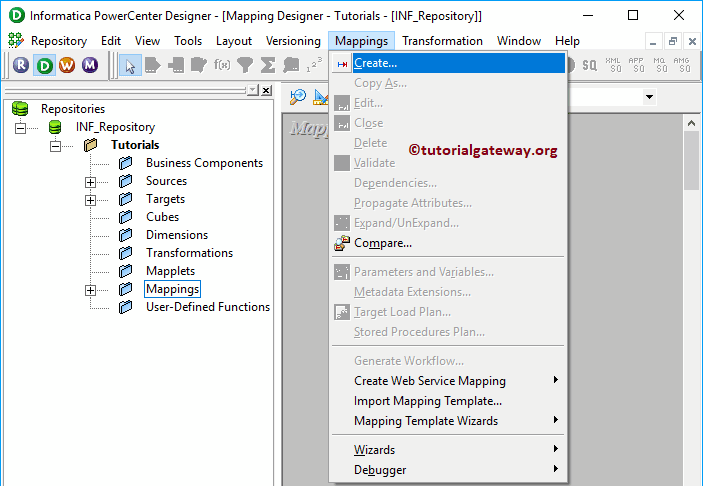 Once you select the Create.. option, a new Mapping Name window will be opened as shown below. Let me provide m_Java as the mapping name and click OK button. 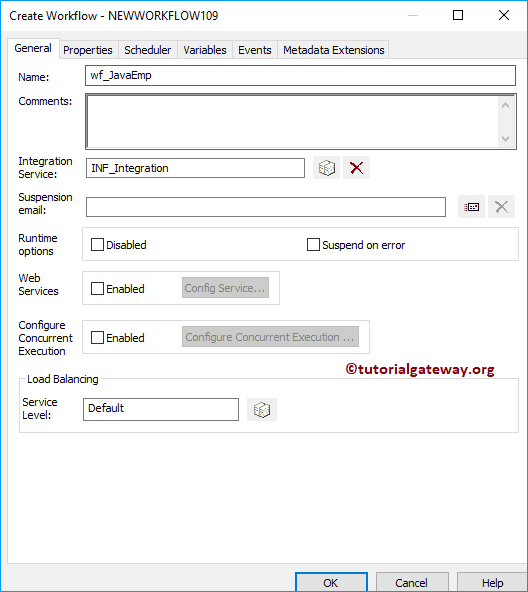 In order to create Java transformation in Informatica, Please navigate to Transformation menu in Menu Bar. Next, select the Create.. option. Clicking the Create button will pop up a new window called Active or Passive. Please select whether you want to use this Java Transformation as an Active transformation or passive Transformation. By clicking OK will create a Java Transformation for you. Let me drag all the fields that are available in source definition to Java transformation. Rename: This button helps you to rename the transformation name. 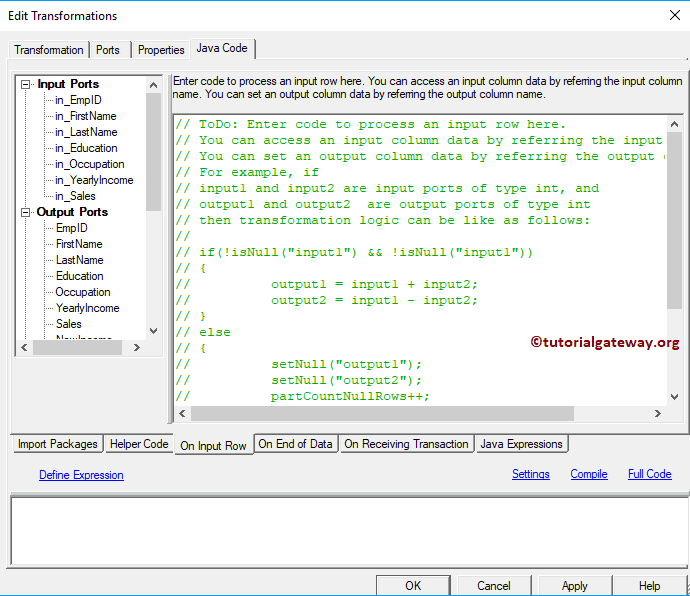 Below screenshot show you the list of available columns in the Ports tab. 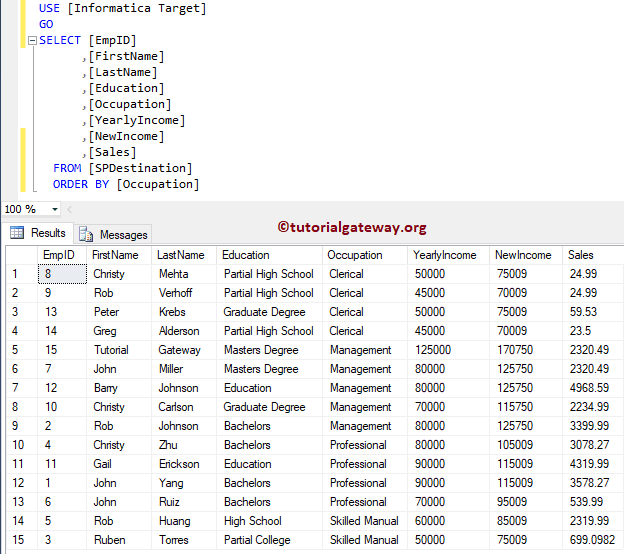 As you can all the columns that are dragged from the source definition are in the OUTPUT section. TIP: Few people may not drag fields from Source Qualifier at this point. They will create both Input and Output fields on their own and then they point them to Source Qualifier. In order to create new fields under the input section. Please select the INPUT and then click the New field button as we shown below. 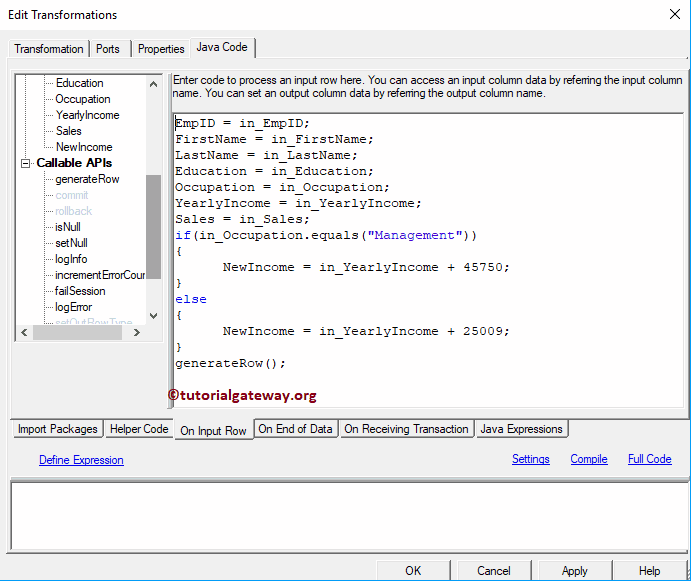 Java Code Tab: This is used to write custom Java code. Here, Left side window is a Navigator window – Which holds all Input, Output ports that are available in Java transformation, and few regularly used functions. 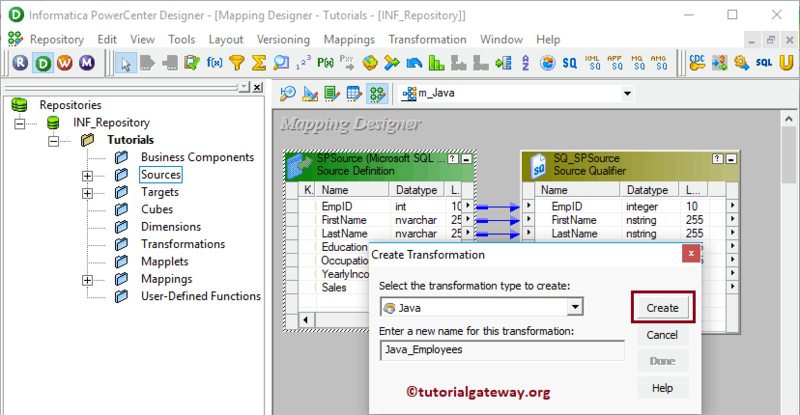 Once you finish configuring the Java Transformation, you have to map the Source qualifier with the Java Transformation Input fields. Next, Drag and drop the target definition (SP Destination) from Targets folder to the mapping designer. 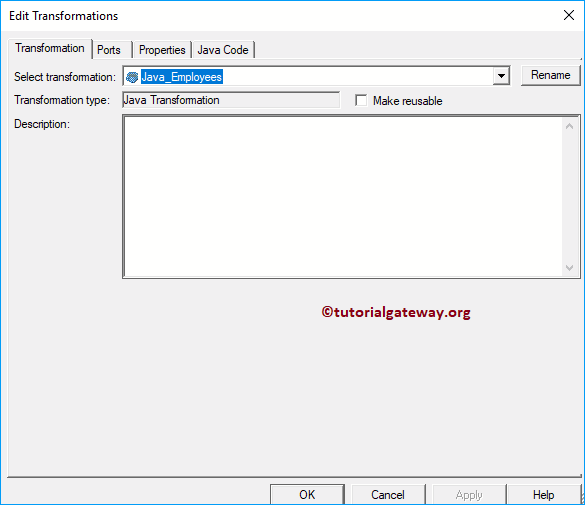 Next, connect the Output Fileds of a Java Transformation with the target definition. You can use the Autolink.. option to connect them. 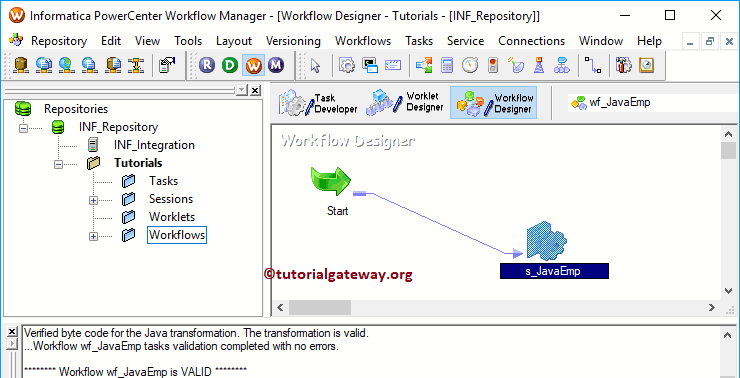 In this Informatica Java Transformation example, we will create the Workflow manually. 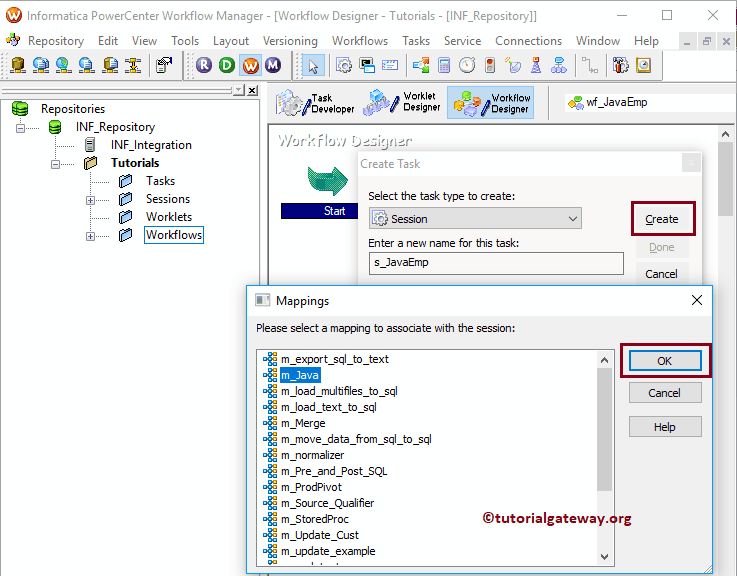 To do so, Please navigate to Workflows Menu and select the Create option. 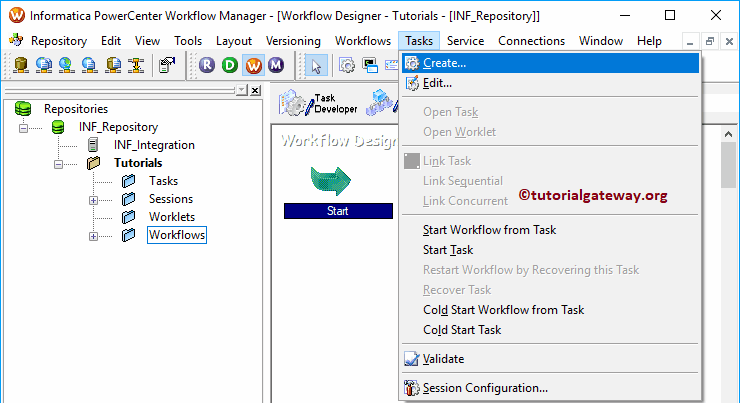 This opens a Create Workflow window as shown below. Please provide the unique name (wf_JavaEmp) and leave the default settings. 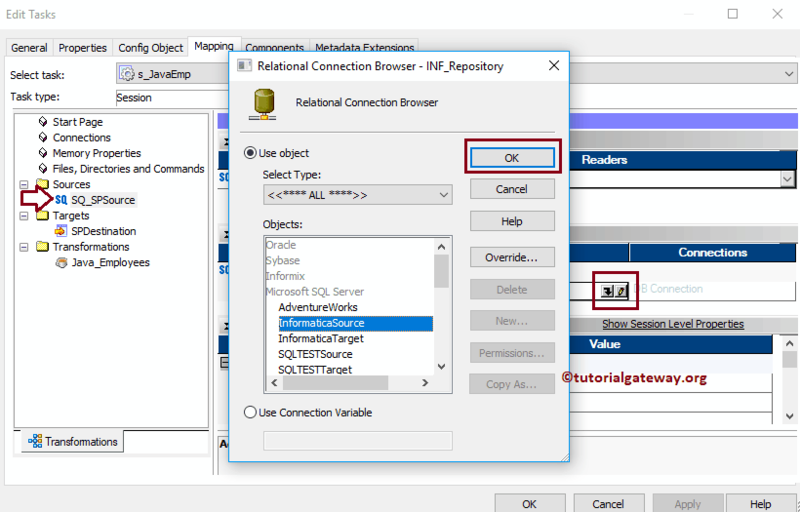 For this Informatica Java Transformation example, we created a Non-reusable Session. To create Non-reusable Session, Please navigate to Tasks Menu and select the Create option as shown below. Please provide a unique name for this session. Here, we are naming it as s_JavaEmp. Once you click on the Create button, a new window called Mappings will be opened. 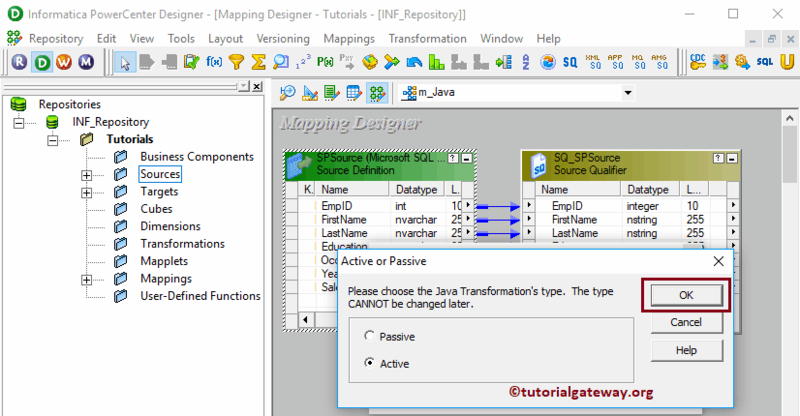 Here you have to select the mapping that you want to associate with this session i.e., m_Java.